Starting the season a little before the scheduled first run, the Beaver Island Boat Company made the first ferry trip of the season today, April 2, 2010. The scheduled first trip was set for Wednesday, April 7, 2010. The boat left on the 2nd at 8:20 a.m., and will return to the Island leaving Charlevoix at 11:30 a.m. The Wendy Anne tug with barge has already made three trips this shipping season, but today was the first for the Emerald Isle ferry. 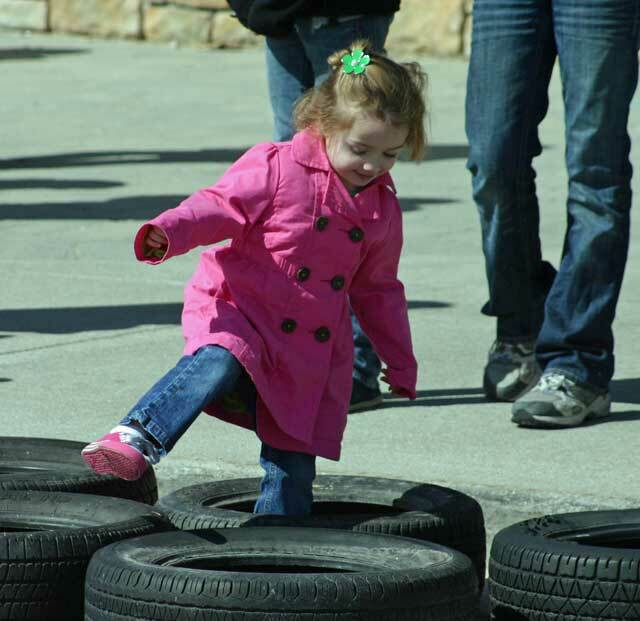 As some of you may have heard, Emmalee had a MRI in Grand Rapids last Monday. The MRI shows some tumor growth (very little) and the doctors are recommending chemotherapy. Emmalee will receive six weeks of IV therapy, with the sixth week of treatment being IV therapy and oral medication, followed by three weeks off. This will all occur on an out-patient basis for 1 ½ years. KK is hoping to secure housing in Grand Rapids for the duration, as Brian will be returning to work shortly. Grandmother Emma Jean Belfy will remain in GR. KK wants to stress to everyone again that what is left of Emmy’s tumor is benign and not cancerous. Emmy will experience nausea and hair loss. KK asks for your prayers, but please no more gifts. Vincent R. Olach, 81, of Ellsworth, died Sunday, March 28, 2010, at his home. He was born April 5, 1924, in Charlevoix, the son of Edward and Marie (Prekale) Olach. Vince served his country in the U.S. Army for 27 years, serving in World War II, in Korea, and two tours of duty in Vietnam. He retired as a Chief Warrant Officer 4. 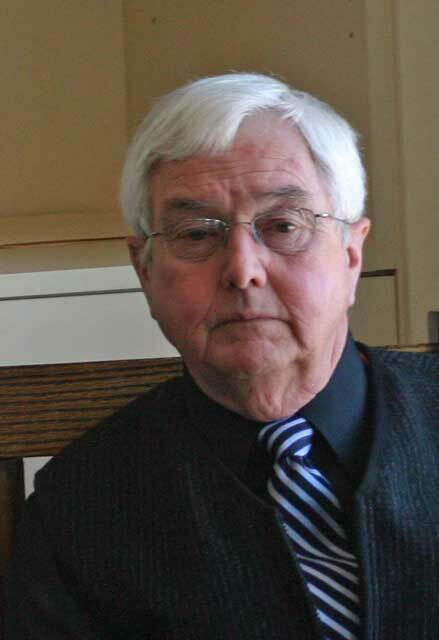 Upon retirement, he worked as business manager for Charlevoix Public Schools. 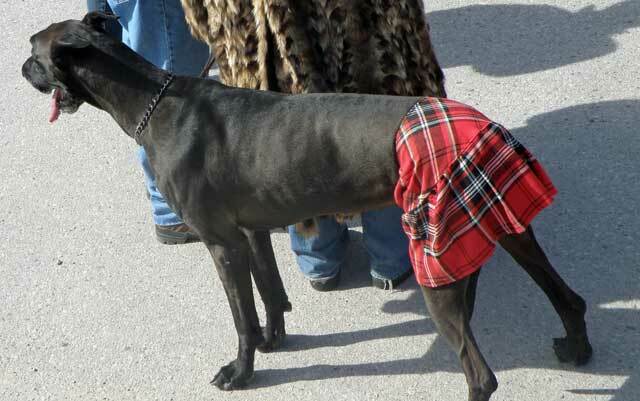 He also served as a section manager of the Charlevoix Chamber of Commerce. 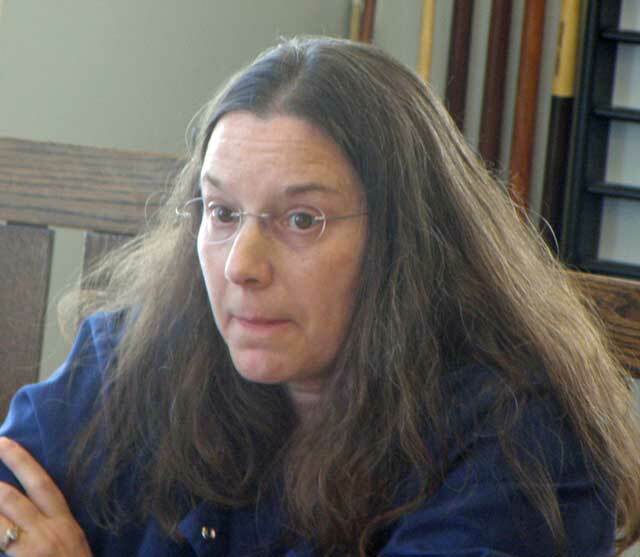 Vince served as a trustee for the village of Ellsworth. On July 15, 1989, he married Janice Raecke on Beaver Island. They lived in Germany for three years and on Beaver Island before moving to Ellsworth. Vince was a member of St. Joseph Catholic Church. He was also a member of the American Legion Leslie T. Shapton Post 0226, Charlevoix VFW Post 1153, Ellsworth Lions Club, Military Officers Association, lifetime member of the U.S. Army Warrant Officers Association. Surviving are his wife, Janice; children, David (Trisha) Olach of Charlevoix, Dorie Ann Erber of Arden, N.C., Darren (Laura) Olach of Longview, Texas; stepchildren, Jill Christine Sanchez of Roseville, Calif., Karen Sue Raecke of Leroy; sister, Edith Close of Charlevoix. He was preceded in death by brothers, Emil Olach, Hubert Olach, Clem Olach, and sister, Dorothy Laurent. Cremation has taken place. Friends may call from 2-4 p.m. and 6-8 p.m. Tuesday, March 30, at Hastings Funeral Home in Ellsworth. 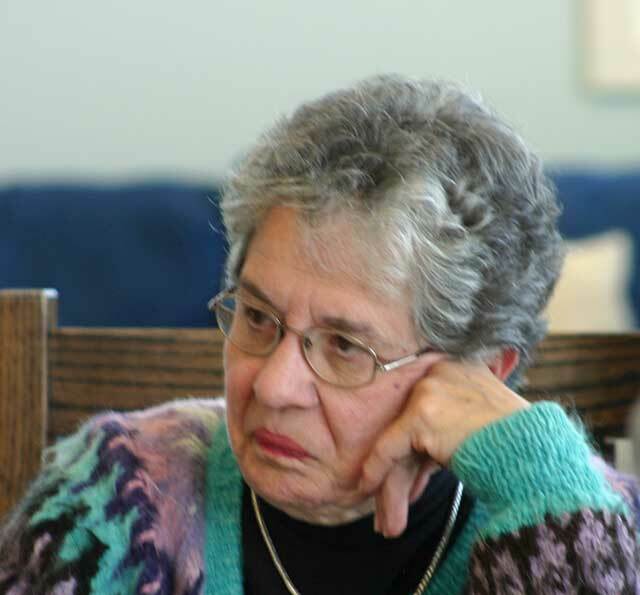 A rosary service will take place at 8 p.m.
A memorial service is planned 10 a.m. Wednesday, March 31, at St. Mary Catholic Church in Charlevoix with the Rev. James Gardner and the Rev. Jerry Hunko officiating. For those wishing to make memorial contributions, the family suggests Good Samaritan Family Services. The St. James Township Board of Trustees will be holding a Public Hearing to review a grant application to be submitted to the Michigan State Housing Development Authority (MSHDA) for Community Development Block Grant funds and to identify Community Development and Housing Needs, including the needs of low and moderate income persons. 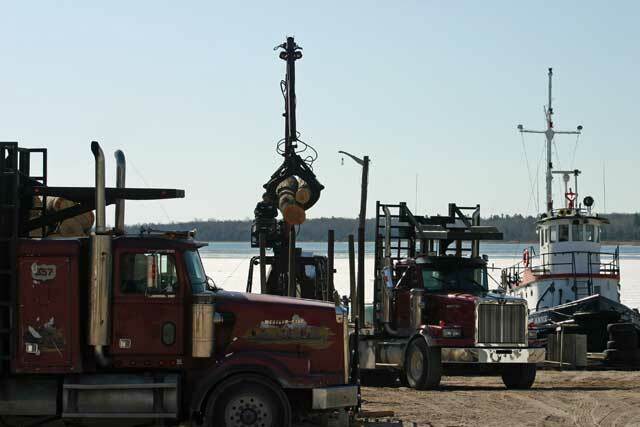 The hearing is to be held Wednesday, April 7, 2010 at 7:30 pm at the St. James Township Hall, 37735 Michigan Avenue, Beaver Island, MI. The purpose of this hearing is to review the application to MSDHA in the amount of $400,000.00. These funds will be used to build a 6-unit apartment building for low to moderate income senior citizens on Carlisle Road in St. James Township. A second purpose of this public hearing is to identify community development and housing needs, including the needs of low and moderate income persons. St. James Township is an equal housing opportunity organization. On the morning of the St. James Township Annual Meeting, there were several types of birds around the area of the USCG Boat House and dock area. Most of the attendees to the meeting were interested in what was going on inside, but there was something interesting going on outside as well. 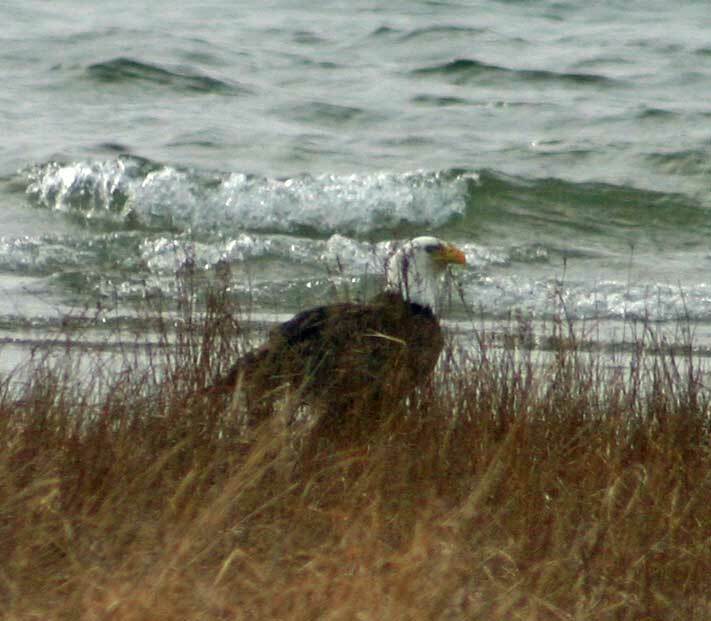 This eagle was feeding on something near the shoreline, and the eagle stayed there for a fairly long period of time consideridng the number of cars that were moving in the area. It wasn't until an empty beer can rolled across road making an unusual sound that the eagle decided to move to other places. These gulls moved in to continue the feast on whatever the eagle left behind. After the meeting, these geese also moved into the same general area of the point. 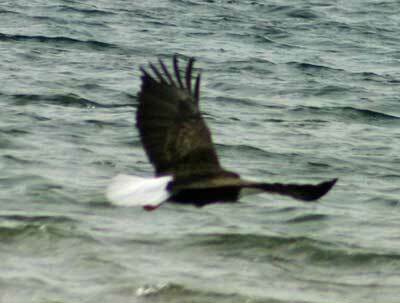 They were scared from their resting place near the lighthouse by a truck moving toward Gull Harbor. All you have to do is stop the rushing from place to place, and you will see the wonders of nature that surround us. 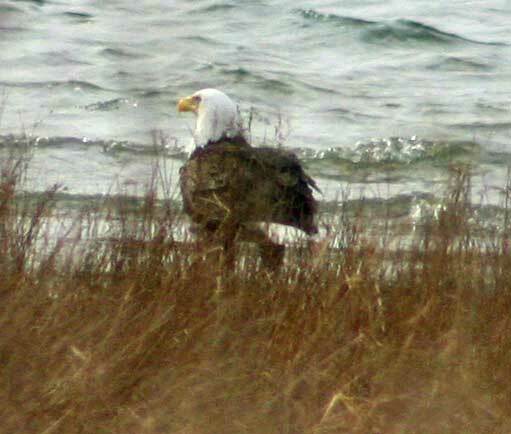 Thanks to Pam Chapman for the heads up about the eagle!. The Charlevoix County Board of Commissioners is pleased to announce the appointment of Mr. Jack Messer as the new Executive Director for the Charlevoix County Commission on Aging Department. 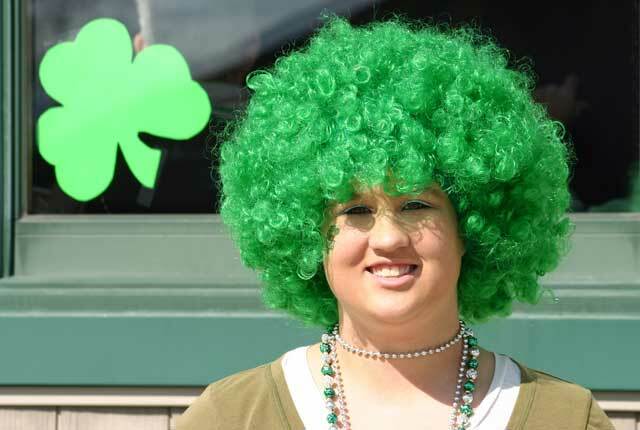 The appointment becomes effective Monday, March 29, 2010. Mr. Messer replaces interim director Mr. David Emmel who has been working on a contractual basis since the resignation of the previous director in August of 2009. In his new role as the Executive Director, Mr. Messer will assume leadership and management responsibility for the department and will report to the Charlevoix County Board of Commissioners. 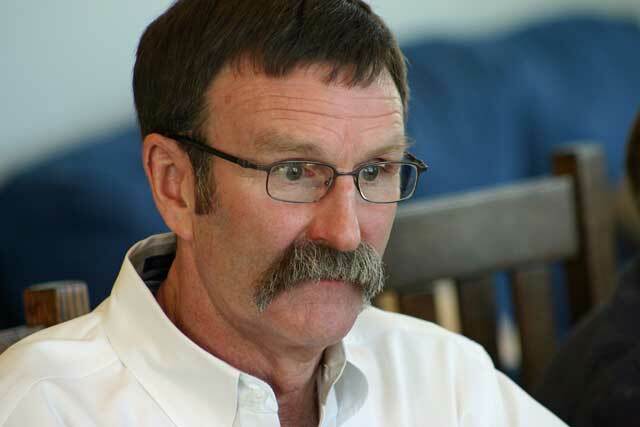 Mr. Messer will also provide a support role to the Charlevoix County Commission on Aging Advisory Board. 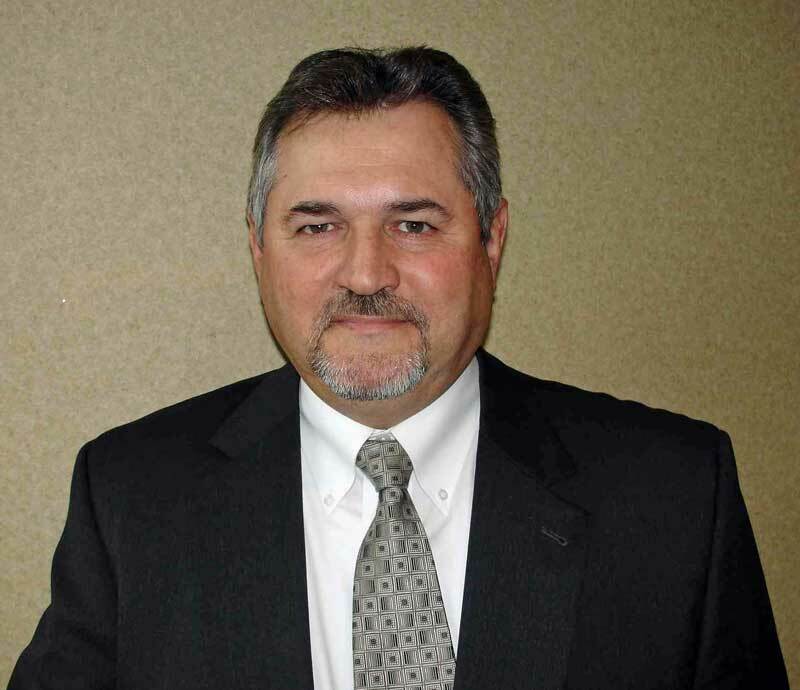 Mr. Messer brings more than 25 years of management and leadership experience to the role. 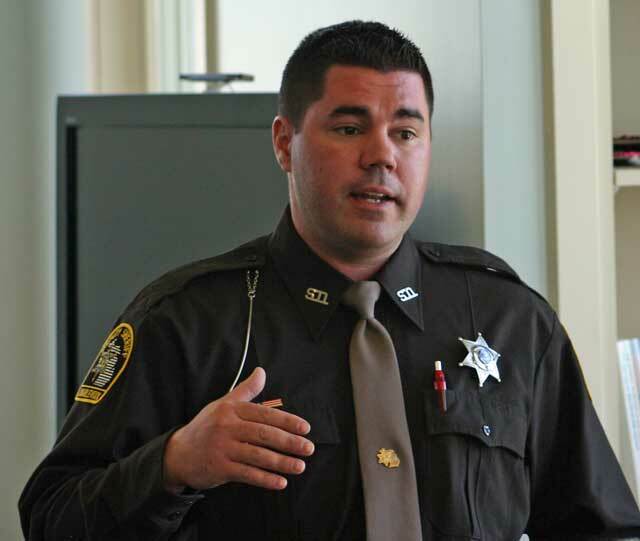 He previously served as the Director for the Charlevoix, Cheboygan, Emmet Office of Emergency Management, Director of Emergency Services with the Sanilac County Sheriff's Department, Chief of Police and City Manager for the City of Sandusky , and the Michigan State Police. 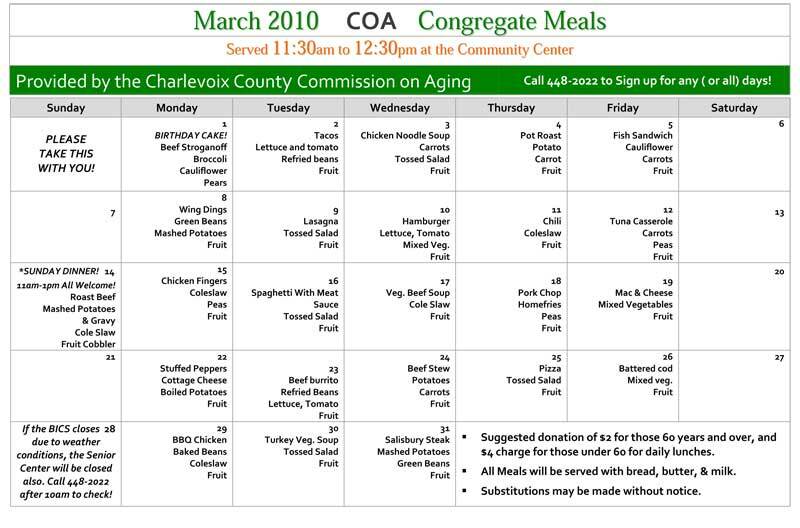 The Charlevoix County Commission on Aging provides in-home respite, homemaking and personal care services, assessment services, congregate and in-home meals, health and wellness programs, and senior center operations services to residents of Charlevoix County over the age of 60. 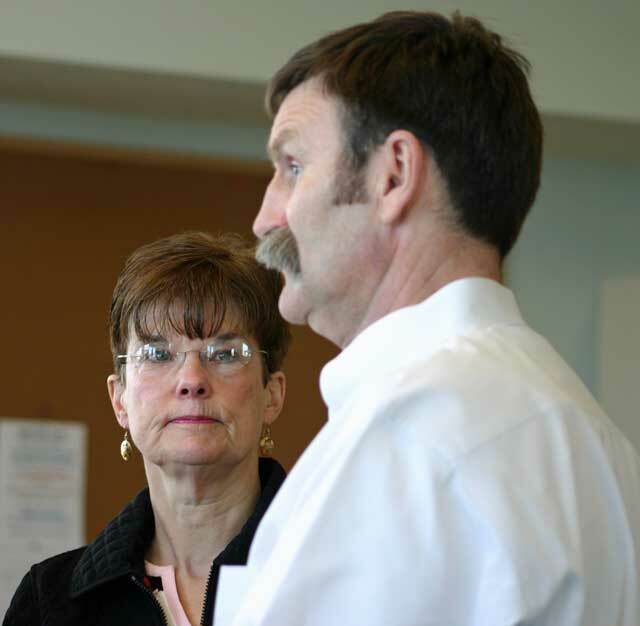 The new COA Director Jack Messer was on the island accompanied by Shirley Roloff and Sheriff Schneider on Friday, March 26, 2010. The gathering took place at the Beaver Island Community Center at 3:00 p.m. and coffee and Girl Scout cookies were provided. A small group of representatives met with Jack Messer at the community center in the upstairs lounge area to introduce themselves to Jack and to get to know Jack and his management style. This "get to know you" gathering was a very positive meeting with clear discussions and idea generation. Contact information was provided to Jack Messer from the attendees. 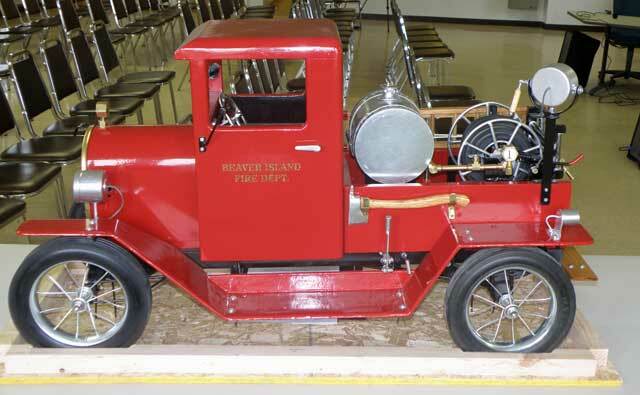 In a somewhat secret ceremony at a potluck dinner for the BI Fire Department, Jack Messer and Shirley Roloff presented the following shown in pictures below along with a commendation letter that is shown below also. The Citizen of the Year nominations deadline is Thursday April 1. A nomination form can be found on the Chamber of Commerce web site www.BeaverIsland.org . Below is a link. The Community Free Clinic, affiliated with Northern Michigan Regional Hospital, has announced that it will be relocating from the Lockwood-MacDonald campus on Arlington Avenue to the main Hospital campus on Connable Avenue in Petoskey in the Spring of 2010. In preparation, new signage is being developed and parking spaces are being clearly designated for patient convenience. To access the new location, patients will continue past the Main Entrance of the Hospital and the parking structure, and follow the signs to the entrance on the left. Hours of operation will remain the same, as will the telephone number.  Office Hours * Monday – Friday * 9 a.m. – 5 p.m.
 Appointment Clinic * Monday * 1 – 5 p.m.
 Walk-in Clinic * Wednesday * Sign in 4:30 – 6:30 p.m. The Community Free Clinic serves our area's uninsured through the dedicated work of volunteer community members and medical professionals, supported by grants, donations, and funding from Northern Michigan Regional Hospital and the Northern Michigan Regional Hospital Foundation. This move will enable patients to benefit from other services offered at the main Hospital campus, such as Lab, Radiology, and the Cafeteria. The accelerated construction schedule of the new John and Marnie Demmer Wellness Pavilion on the Lockwood-MacDonald campus has prompted this relocation. Northern Michigan Regional Health System is grateful to the generous donors and volunteers who have given so much of themselves to both of these initiatives. The staff and volunteers at the Community Free Clinic look forward to continuing their mission of providing access to quality healthcare at their new, centrally-located clinic. On March 31, 2010 (Wednesday) a representative from the Department of Agriculture Fish and Wildlife Services will be on the island to conduct this year's cormorant harassment training. There will be a significant increase in their activities over last year and the Wildlife Club has allocated additional monies to help in their efforts. Likewise the club expects to increase our activities especially the harbor area. If you are interested in participating in the harassment program please attend this meeting. You do not have to be a member of the wildlife club to help in these efforts. The meeting is at 7:00 PM at the Peaine Township Hall. 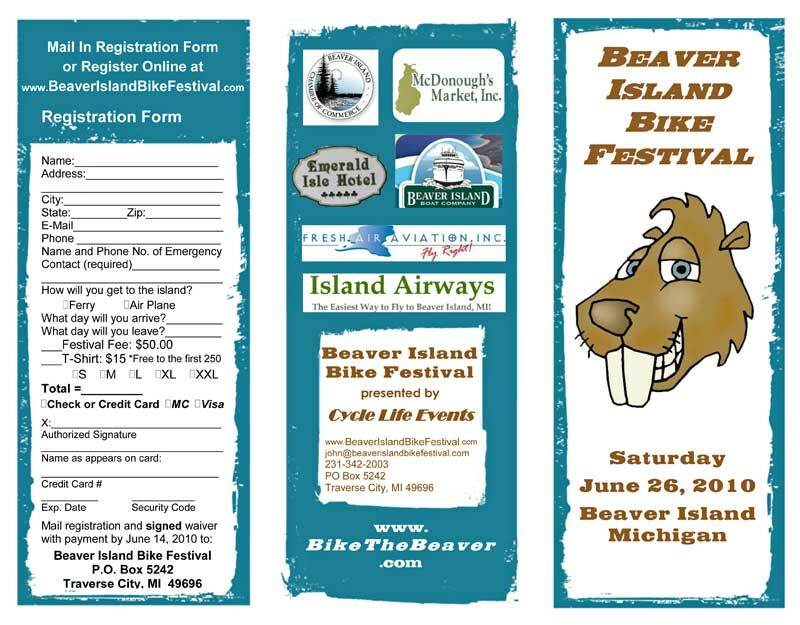 Program is sponsored by the Beaver Island Wildlife Club. 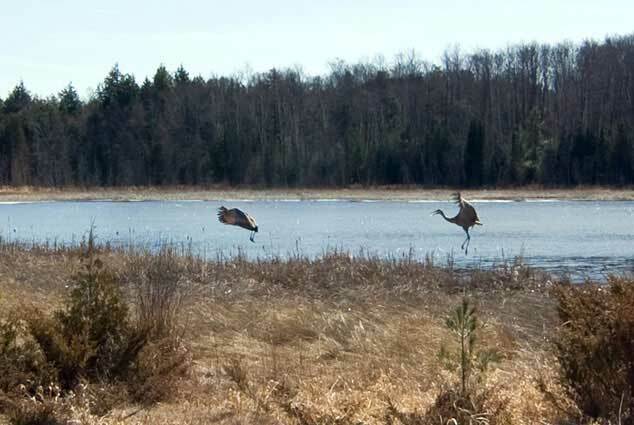 Frank stopped at Barney's Lake and caught these sandhill cranes playing around a little bit. It is spring, and perhaps the mating dances are beginning. Nonetheless, these are amazing pictures, Frank. Thank you! The first three medical first responders to go down to Traverse City, Michigan, to take their National Registry Exam, have all three been successful. Danielle Dedloff became a nationally registered first responder on 3/8/10 followed quickly by Tammi LaFreniere and Deb Bousquet. Congratulations to these first three to take the exam. (Updated 3/17/2010) Kevin White and Garrett Cole have also been successful on the National Registry exam. Congratulations to both of you as well. Congratulations to Dan Burton who was also successful in completion of the National Registry Exam. Good Job! 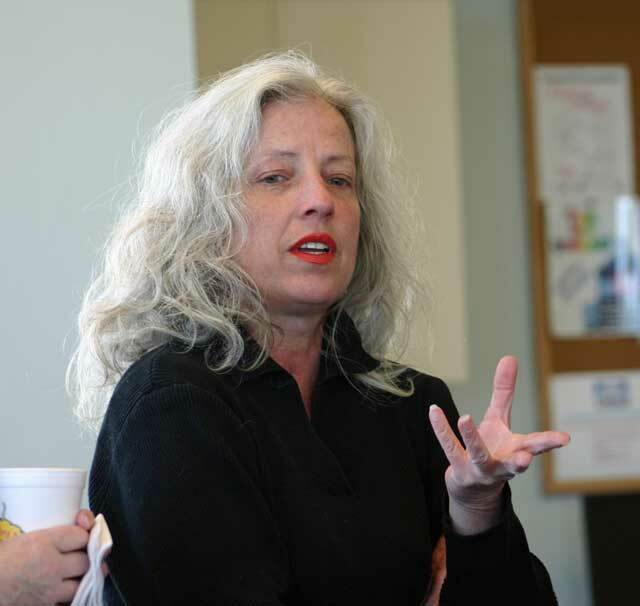 And kudos to their first responder instructor Sarah McCafferty as well! 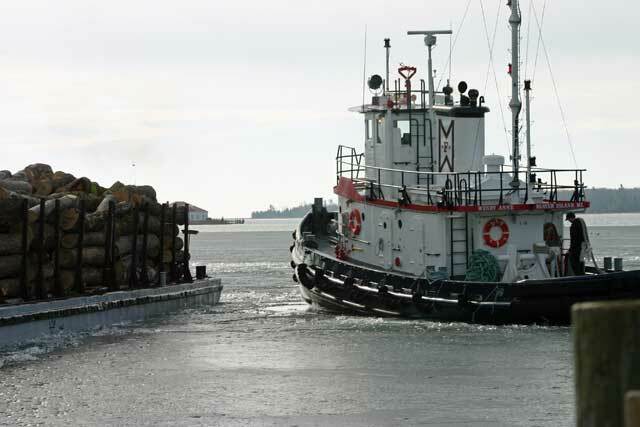 In a relative surprise this morning, March 18, 2010, the Wendy Anne tugboat and crew decided to make its maiden voyage of the year 2010 by pulling away from the dock. It began in an unproductive way, but ended with the barge in tow on the way out of the harbor. 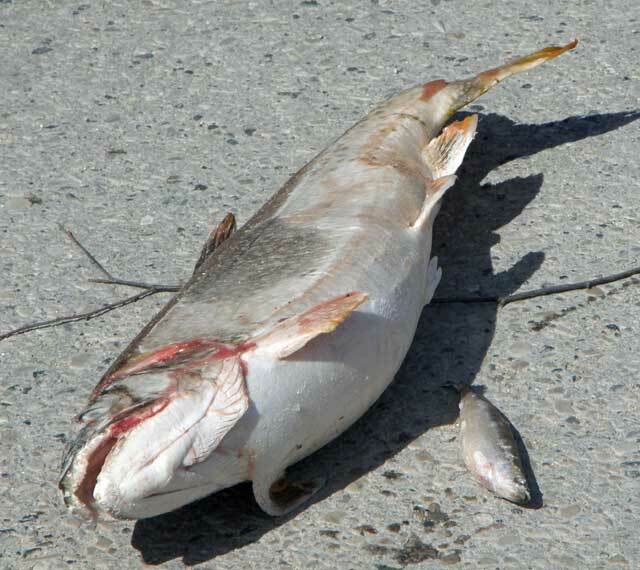 First of all, the water level in the harbor is down. The Wendy Anne went temporarily aground in the mud just off the its dock. 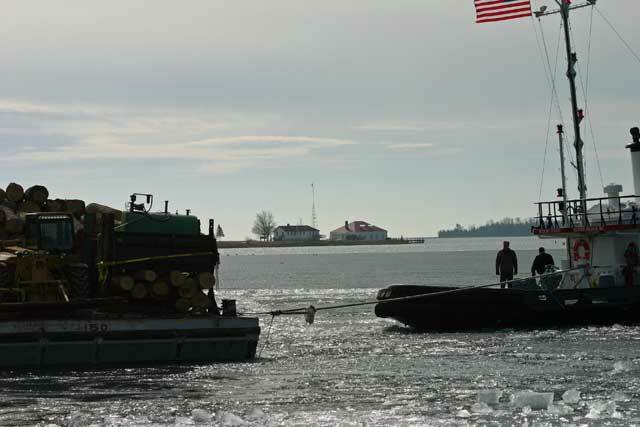 Using wenches, the Wendy Anne was pulled free, and the icebreaking began from the Beaver Marine dock out to the open water near the Beaver Island Boat Company Dock. 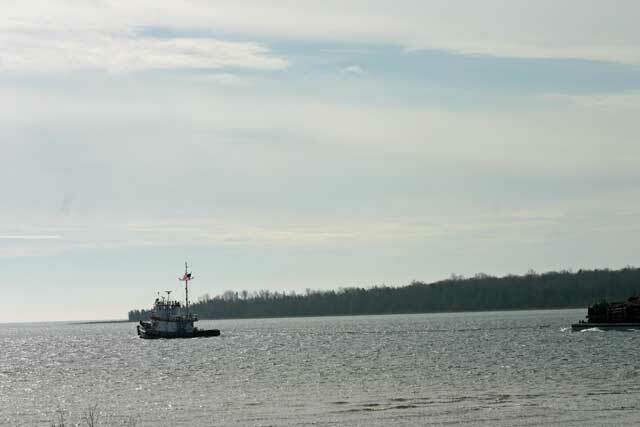 After breaking up the ice, the Wendy Anne returned to its home dock and came alongside the barge. 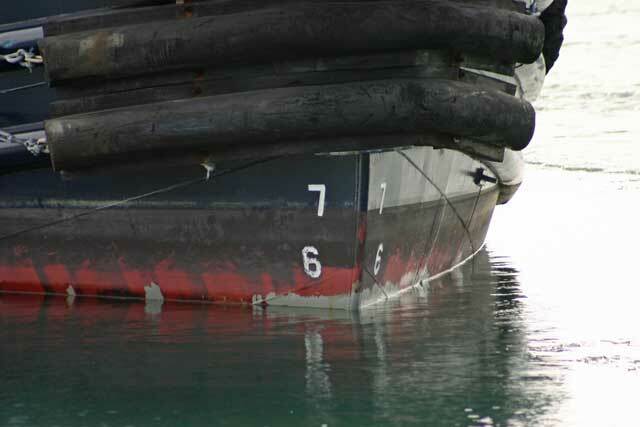 The dockside portion of the barge was pull away from the dock in preparation for the trip. Pulling the barge loaded with logs, the Wendy Anne began its passage in the shipping lanes of the harbor, came to the BIBCO dock, and headed out of the harbor. All in all, quite an exciting morning for those that had the time to watch. Headed out.......Safe voyage, Wendy Anne! The crew of the Wendy Anne made a second trip this past week. 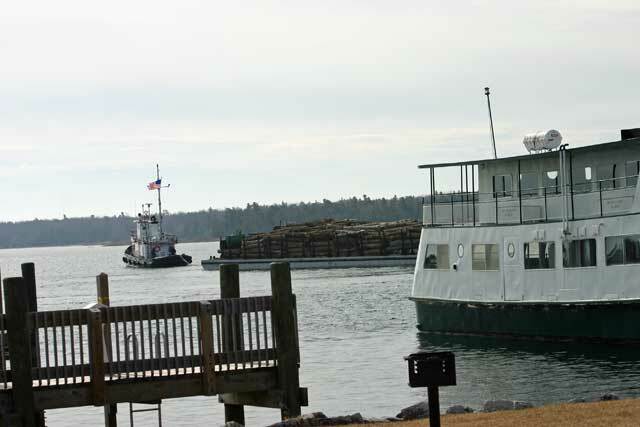 The tug and barge went out much more quickly than the previous trip. The voyage went much more quickly as well. The shipping season has begun. Way to go Matt Fogg and crew! 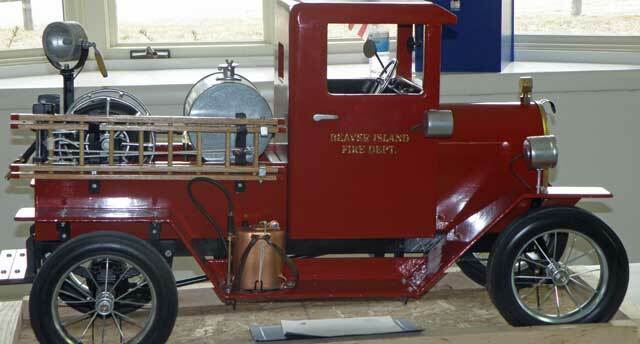 from Beaver Island News on the 'Net!! There are people in this world that wouldn't be able to determine the relationship between the following pictures. What is this relationship? Do you know? Can you tell? 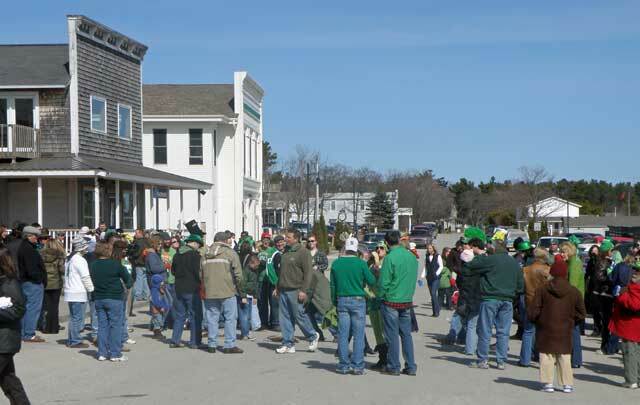 The answer is the St. Patrick's Celebration Weekend on Beaver Island!! Administers and enforces the township zoning ordinance. The administrator issues land use permits, performs inspections and is the ordinance enforcement officer. 2. Enforce the provisions of the township zoning ordinance. 3. Review and investigate permit applications to determine compliance with the provisions of the zoning ordinance. 4. 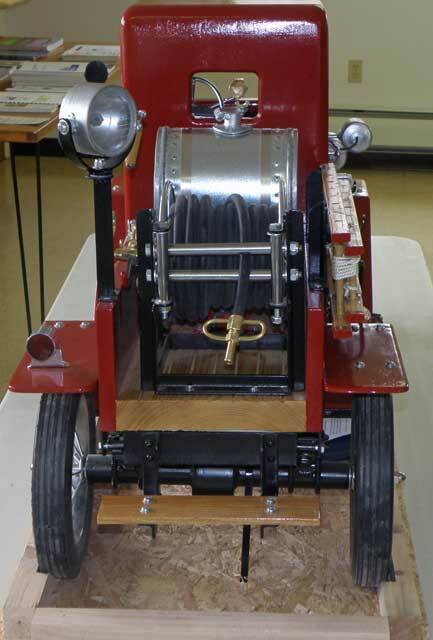 Maintain a working knowledge of all applicable township zoning ordinances. 5. Assist citizens and private or public agencies in determining what zoning forms and procedures, apply to proposed zoning requests and land use changes. 6. Attend meetings of the Planning Commission and Zoning Board of Appeals as staff representative. 8. Maintain the official zoning maps, keep all text and office records up to date, by recording all amendments and retaining all official documents in a systematic filing procedure. 9. Attend seminars, workshops, and other continuing education classes, as appropriate and/or requested by the supervisor, with Township Board approval prior to attendance. 1. High diploma or equivalent required. 2. Ability to understand and interpret drawings, diagrams and property descriptions. 3. Previous related work experience or training would be helpful. 4. Valid driver's license and personal vehicle required. 5. Good communication skills, both written and oral. 6. Good interpersonal skills, to interact effectively with citizens and township officials. 7. Ability to meet deadlines, to organize, prioritize and work independently. The Zoning Administrator shall submit a report, summarizing his or her activities to the Township Board and the Planning Commission by February 1 st of each year. After receipt and review of the report, the Township Supervisor, shall meet with the administrator for an annual review of duties and performance. 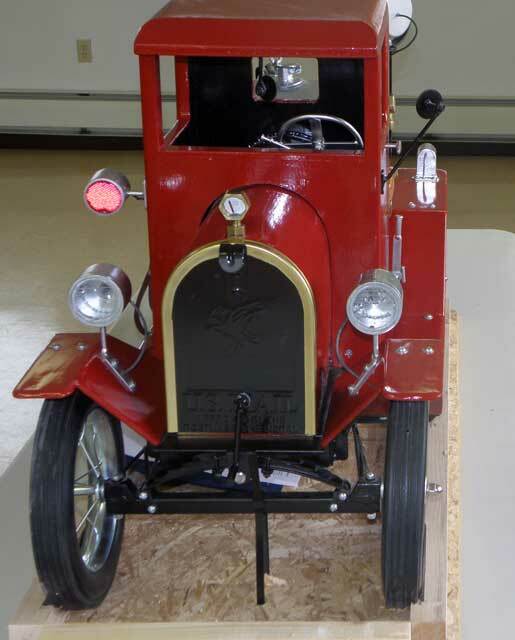 A summary of this review will be submitted to the Township Board members. (March 15, 2010) — TDS Telecommunications Corp. (TDS®) announces high-speed broadband Internet service is now available to the residents and businesses of Beaver Island. TDS will offer speeds ranging from 1.5Mb to 10Mb. TDS’ new high-speed broadband service is available to nearly all businesses and residences on Beaver Island. 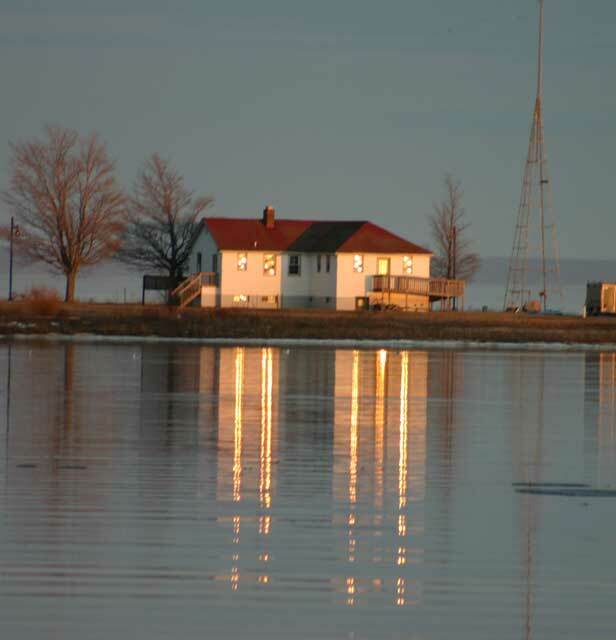 Because high-speed Internet service is a distance-sensitive technology, speeds may vary and services may not be available to all TDS customers on Beaver Island. Residential prices start at $39.95/month; prices for business customers begin at $49/month. For more information, or to sign up, call 1-888-CALL-TDS. There will be cookies, treat Bags and prizes! The Egg Scramble will be held in the gym so bring your empty Easter basket and bring your camera for pictures with the Easter Bunny in the gym lobby. Whimsy, Jim Wojan Excavating Co. The Beaver Island District Library is now a subscriber to Ancestry® Library Edition, distributed exclusively by ProQuest and powered by Ancestry.com which delivers over 4 billion records in census data, vital records, directories, photos, and more. You can access Ancestry® Library Edition from any of our public computers or bring your laptop to the library because you can use it within range of our WiFi. The difference between this and the Ancestry you would subscribe to personally is that you cannot write to ours, but you can use any of the 4,000+ databases to gather that information you've been hunting for about Aunt Blanche or Great, great, great grandpa Higgins. Ancestry Library Edition brings the world's most popular consumer online genealogy resource to your library. It's an unprecedented online collection of over 4 billion individuals from North America, Europe, Australia, and more. Answers await everyone—whether professional or hobbyist, expert or novice, genealogist, or historian—inside the more than 4,000 available databases. Here, you can unlock the story of you with sources like censuses, vital records, immigration records, family histories, military records, court and legal documents, directories, photos, maps, and more. U.S. collections deliver hundreds of millions of names from sources such as federal and U.S. censuses; birth, death, and marriage records including the Social Security Death Index; and U.S. border crossing and trans-ocean ship records. Canadian collections provide nearly 60 million records from the Census of Canada; and key vital records, such as the Drouin Collection (1621-1967), which includes nearly 30 million baptism, marriage, and burial records from Quebec. U.K. collections offer censuses for England, Wales, Isle of Man, Channel Islands, and Scotland, with nearly 200 million records; Births and Baptisms (1834-1906), Marriage Licenses (1521-1869), Deaths and Burials (1834-1934), and Poor Law Records (1840-1938) in London; and more. Other international collections continue to grow with more than 46 million records from German census, vital records, emigration indexes, ship lists, phone directories, and more; Chinese surnames in the large and growing Jiapu Collection of Chinese lineage books; Jewish family history records from Eastern Europe and Russia; and more. Military collections deliver over 150 million records containing information often not found elsewhere; and includes records from the colonial to the Vietnam era. Multimedia collections deliver millions of files ranging from family and gravestone photos to postcards and newsreels. All this, plus an intuitive search interface, detailed search indexes, and helpful Learning Center tools, makes the Beaver Island District Library's subscription to Ancestry® Library Edition an indispensable resource. 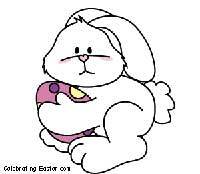 St. James Episcopal Church will not hold Church Services on Easter Sunday, April 4 or the following Sunday, April 11. 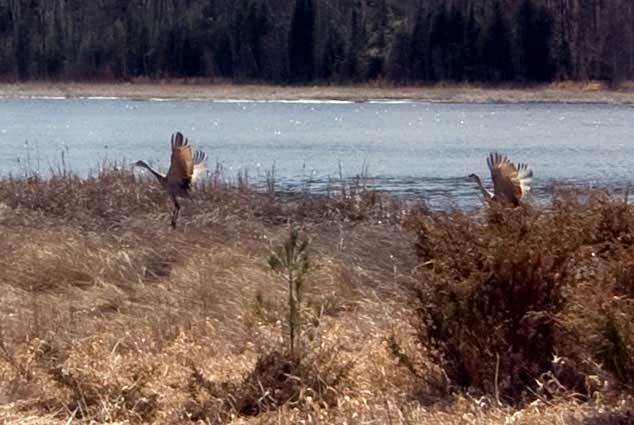 We have been informed by Russ Mason, Chief of Wildlife Division, Michigan Department of Natural Resources that it is MOST LIKELY, there will be a fall turkey season on Beaver Island. 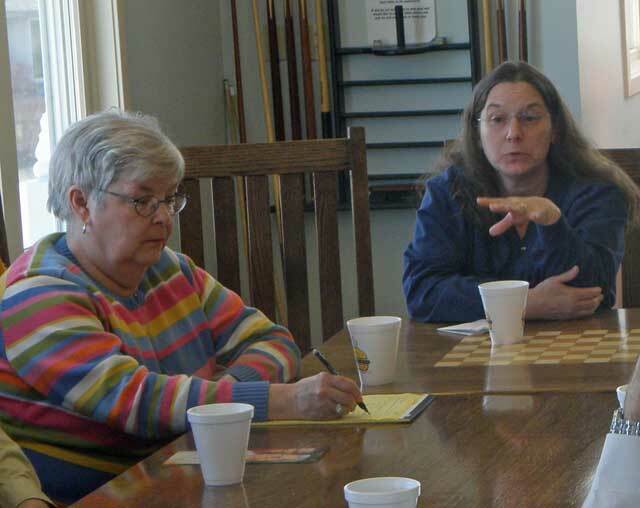 We hosted a public meeting on March 5, 2010 at St. James Township Hall to discuss various wildlife management subjects. 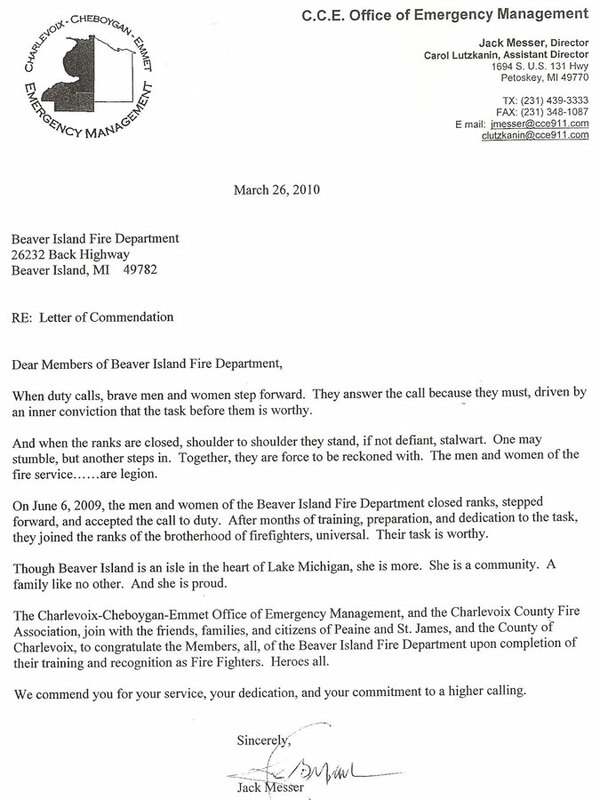 I asked Brian Mastenbrook and Tim Reis at the time why Beaver Island could not be designated a unit separate from J (all of Charlevoix county). That was a matter that Brian has explored already but we were denied. Then Tim informed us that under unit J there would be no fall hunts here in 2010. I spoke up and asked the question, “If I showed up dressed in feathers do you think the powers to be would change their minds?” That did get a laugh and it just may have produced the result we wanted. Tim and Brian convinced Russ Mason to reconsider and it looks like we will receive a separate unit status in time for the fall hunt. This is good news to all of us turkey hunters although maybe not good news to the 800+ turkeys out there. There are those on both sides of this issue that want Beaver Island News on the 'Net to choose sides. This website will not allow either side to determine what is posted here and what is not posted here. The editor of Beaver Island News on the 'Net wishes to provide information. Information is power only if it is shared in a timely manner! 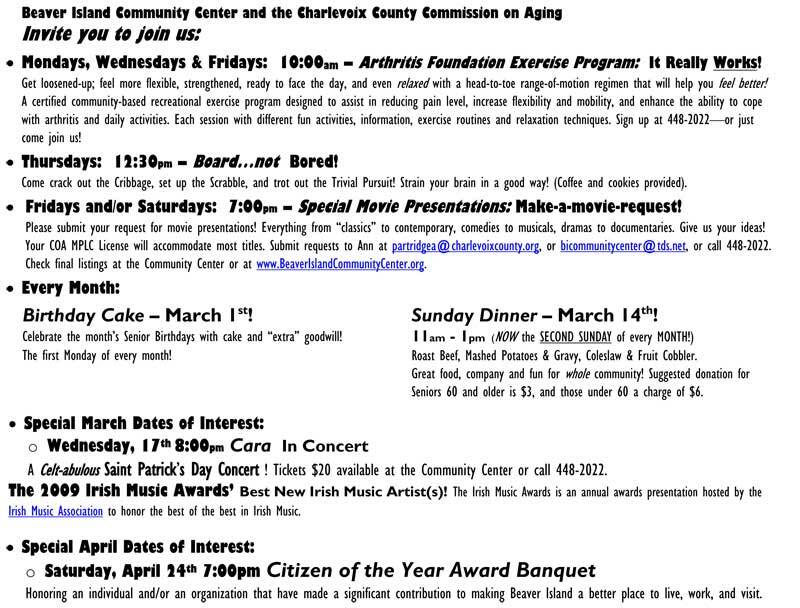 Beaver Island News on the 'Net will post information in as positive a way as can be determined by the editor. If you are looking for someone to post anything and everything, no matter in what form received, you have sent your information to the wrong place. If one side or the other decides that this website is not being fair, then there are other places to post your information. 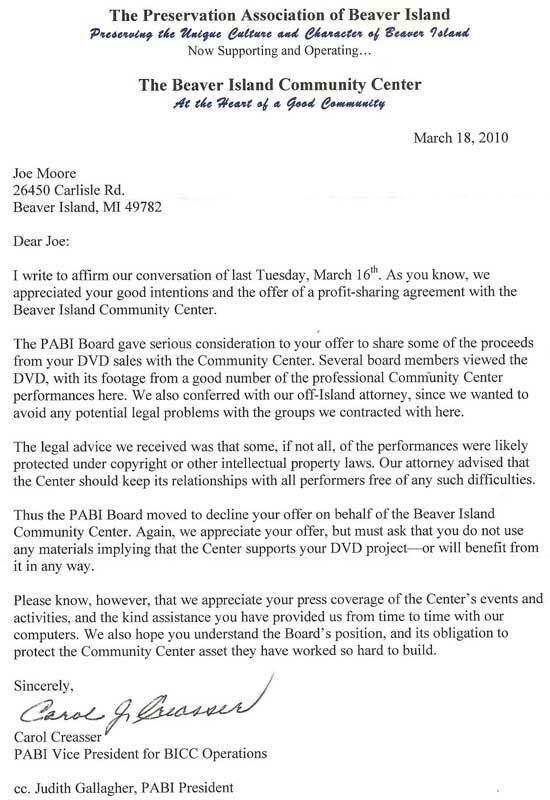 Just like the Northern Islander and the Beaver Beacon, Beaver Island News on the 'Net will edit Letters to the Editor for length, but will also attempt to eliminate negativity without changing the facts. This website will NOT be dicatated to by either side of any issue including the BI Wildlife Club versus BI Conservation Club issue. Now, to get back to the Quality Deer Management issue, Beaver Island News on the 'Net has posted educational video for anyone interested. They can be found from the homepage of this website. You do not need to be a subscriber to view these video clips. 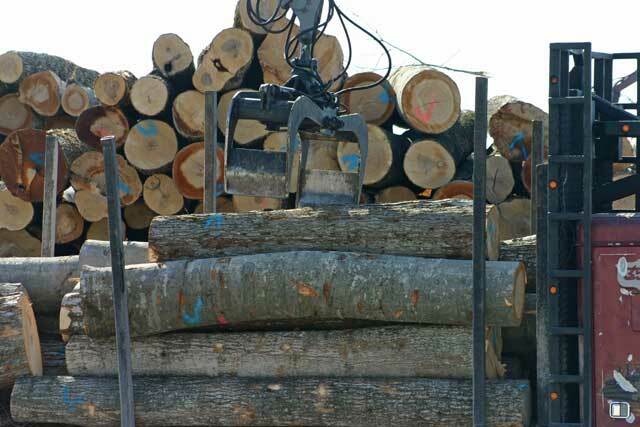 Beaver Island News on the 'Net has posted a link to survey regarding deer management. 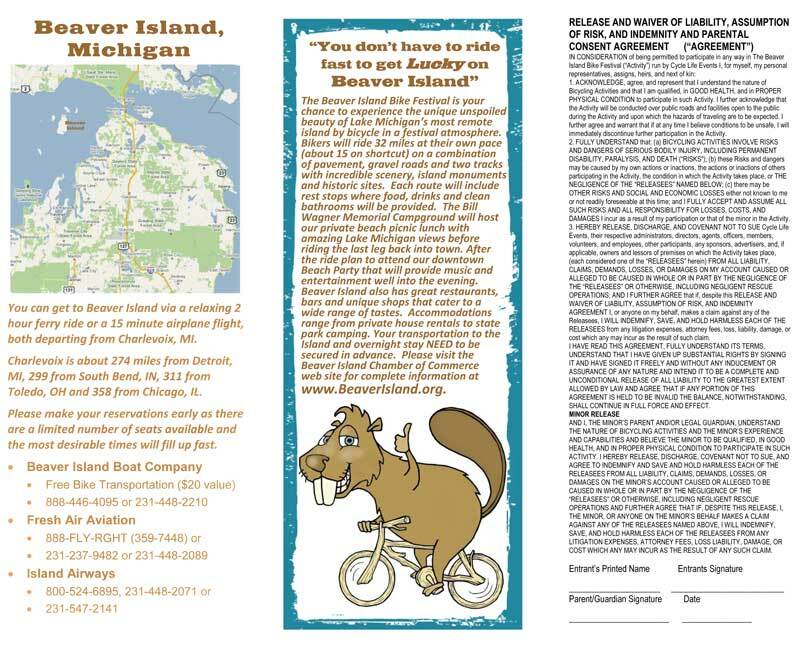 Beaver Island News on the 'Net will publish the results of that survey if they are provided to us. 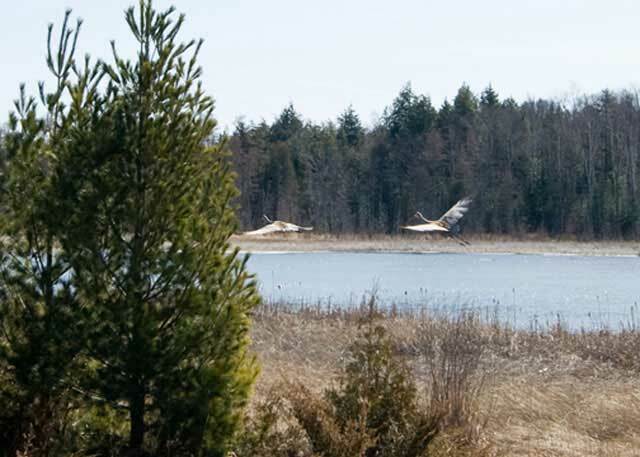 Beaver Island News on the 'Net will await the consensus of the Natural Resources and Eco-Tourism Commission (Committee) and will gladly publish the minutes of this meeting if they are to be made public. The March 23rd meeting is not an open meeting and only includes those invited by the committee, which includes officers from both of the above mentioned groups, but any minutes will be posted when and if received. 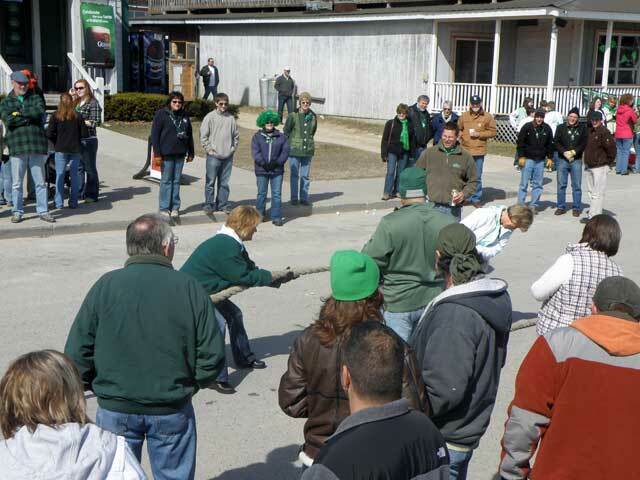 On a surprising note, the Peaine Township meeting of March 10, 2010, was just a little over 70 minutes. The topics that may have caused serious disagreement seemed to have been worked on quite a bit outside of the meeting, not by the board members necessarily, but definitely by the committees and commissions. This meeting was a pleasant and successful meeting with a great deal accomplished in a short period of time. The appointments were made to the various organizations, the airport committee was discussed, the waste management committee was discuss, and this was all accomplished with only a small amount of questioning by the public and with excellent answers by the board or the board's representatives. Information was presented, shared, and decisions were made. There are quite a few subscriptions that will expire or that have already expired in March, 2010 and April 2010. We appreciate your support and ask you to renew your subscription as soon as possible. Emails have been sent out, but quite a few have been returned without delivery, which means that BINN does not have your current email address.